Further abandoning the sacred line and the safety of an enclosed geometric shape, I studied the formats of Neo-Expressionism and its dismissal of perfecting the ‘known object’. This is a hard concept when it comes to an icon like Mickey that does, for the most part, rely on its known shape to be considered authentic. Sure the shape can change to the aesthetic of the artist, and we’ve seen this with many artists (Ex: Keith Haring, Ron English, etc) and Mickey Mouse in the past… but formulating my own voice and aesthetic in a Neo-Expressionist fashion, without compromising the structure of the tenxtenxten regulations (the silhouette must remain the same)… well… it was just a different story. In coming up with own voice, I decided to research through the pathways of one of the most notorious Neo-Expressionist painters, Jean-Michel Basquiat. This was somewhat of a dichotomous subject, as Basquiat’s work was mostly on sociopolitical gatherings rather than commercial commentary. Furthermore the idea of Mickey Mouse integrated as a main subject HAD to appear mentally salubrious to the viewer. I realized that this was a focus on aesthetic rather than actual parallel communicative content to Basquiat’s vision, and pushed further through the piece painting it as a surface level execution. 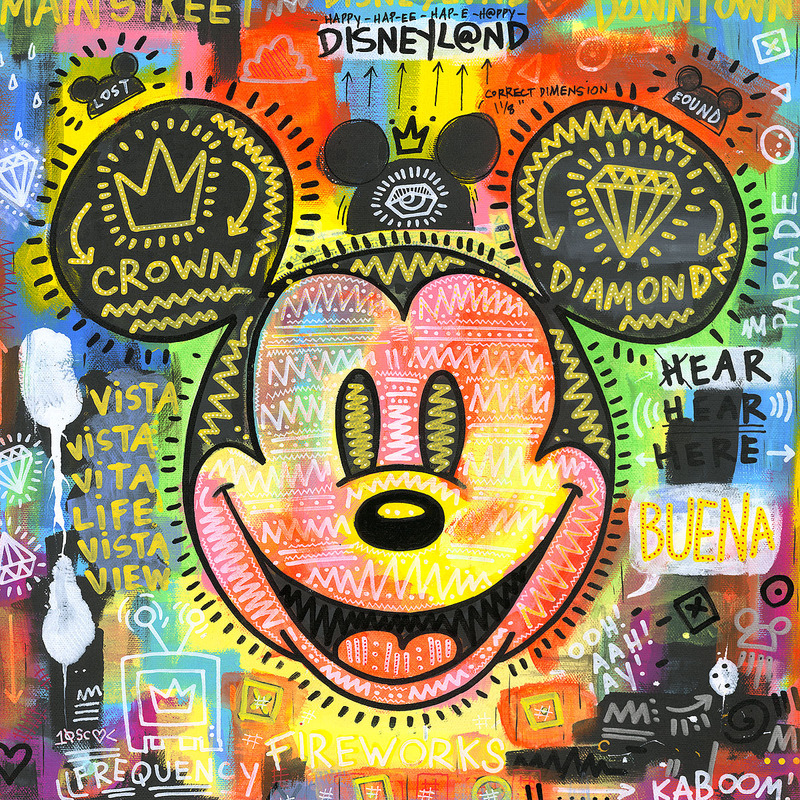 This piece asks the question, how would a Neo-Expressionist painter approach the idea of visiting Disneyland and paint his or her transgressive experience? That very question was answered in this piece. This is called “Cazador de Sueños”, which means “Dream Hunter” in Spanish. It reflects an abstract vision of visiting Disneyland in Anaheim, California. There are areas here that relate to Disney such as “Main Street”, “Downtown”, “Parade” and “Fireworks! Ooh! Ahh! Yay! Kaboom!”, and carries familiar words associated with its brand like “Vista” on the left hand side and “Buena” on the right hand side (Buena Vista). There are two hats which say “Lost” and “Found” which represents beyond the surface level idea of a department, and more hones in on that ‘lost’ feeling we so often get in our lives, and that ‘found’ happiness we have when we visit the park. Beyond that, the central most hat with the eye represents an opened consciousness when coming to the park.. and that newfound vision of bliss we see when entering the park and enjoying all that Disneyland has to offer. This comes as number 8 in the Contemporary Modern Series, and is number 74 in the TENxTENxTEN collection.